This is literally a page from Seth Godin's What Matters Now free ebook. It's a compilation of ideas from 70 big thinkers about what to think about in 2010. It's a quick read. What struck me Gina Trapani's thoughts on social productivity - "Getting things done is not the same as making things happen." While she is talking about personal leadership and making a difference, I think that phrase gets at the difference between organizational productivity and social productivity. 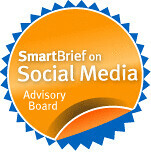 It's an idea we explored in our forthcoming book, The Networked Nonprofit. How has connectedness changed the way you're working? Are you focused on checking off the to do list or making things happen? How do you manage the balance between the two modes of working? my motto has been "get sh*t done" for the past few months, but now I think I'll switch it up a bit to "make sh*t happen!!" 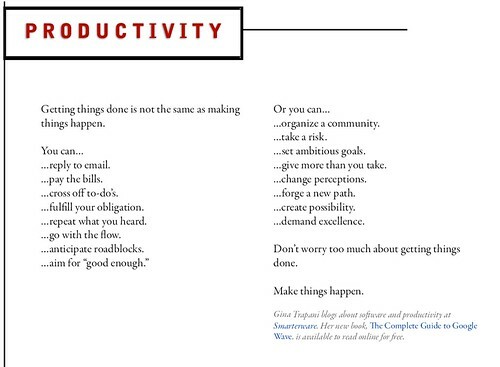 I have read this page already as I had downloaded this great eBook from Seth Godin last week, but I was just not able to make out the sole point which you have said quite well here, its about making things happen, not getting things done. Connections have really changed the way we do things a lot because now we interact with many people of same our different mindsets, we are influenced by some of them to do something new in a given time or we influence others by taking our time. When does demanding excellence turn into burnout or being obsessed? Its the balance between "good enough" and "excellence" that is so important and difficult to achieve. No one can excel at everything in their life, so by default something has to be just good enough. Which things are important enough to push oneself is what makes us individuals or what creates differences between organizations. I do have a to do list (I first address my top 3 items each day). But the items are based on being effective, not efficient. I don't see a difference between checking off the to do list and making things happen, if the to do list was created from the proper perspective. Certainly, connectedness allows me to be more effective at times. keep you eye on the ball and the goal post at the same time and find that happy medium where both elements are taken into consideration.